Job applications may seem like a tedious task since there are tons of documents and requirements that you should prepare. One of these documents is the cover letter. Job application cover letters will do more than just highlight what you have stated in your resume. It will fill in items your resume is not able to cover. It will also help you elaborate on what your goals are and why you see yourself to be a good fit for the job position that is being offered. When it comes to job applications, an applicant will most likely send out application forms and documents to multiple companies in order to increase the chances of getting invited for an interview. One mistake that a lot of applicants make is that they only make one cover letter for all of these applications. This should not be the case as cover letters need to be customized accordingly with the company’s goals and what it is they are looking for when it comes to their employees. Writing customized cover letters may seem like a very time-consuming task but it does give the impression that you are eager and enthusiastic about becoming an employee of the company. There are a number of reasons why you should opt to have your job cover letters customized. In this article, we will give you a brief discussion of five reasons why this should always be the case. Read on! This resume cover letter example will give you more than just a sample cover letter. It will also give you a brief overview of what a cover letter is all about and what the content of a cover letter should be. Why Is It Important to Customize Cover Letters? Businesses make sure that their image and branding is known by their target audience. Just like a business, marketing yourself to the company you want to work for starts with a good cover letter. It is the key that you would use in order to keep the hiring manager curious and interested in what it is that you have to offer that could benefit the company. To stand out from the crowd. Sure enough, there are multiple applicants who are seeking to be accepted in the same position you are applying for. By writing a customized cover letter, you are able to speak in your own voice. This way, it will be more convenient for you to talk about yourself, what you can offer, and what are the unique attributes you possess that makes you different from the other applicants. To make it very clear that you are qualified for the job. Cover letters are meant to highlight your qualifications, skills, and other relevant things that may not have been covered by your resume. By picking out your most relevant qualifications and skills for a certain position makes it easier for them to screen whether or not you are a good fit for the company. To demonstrate a genuine interest in the opportunity. You want to convey a message and give a good implication to the hiring manager about your passion and interest in becoming a part of the company. By customizing your cover letter to the company and position you are applying for, you give them an assurance that you are willing to learn and that you are going to always put your best foot forward for the welfare of the company. To ensure that the appropriate keywords are included for the automated screening. A quick tip you should always put in mind is the fact that composing resume cover letters that is an accurate match for the job position available comes with effort. You may also take a look at the job posting and pick out a few relevant keywords you can incorporate into your cover letter. By aligning the keywords with your own set of skills and qualifications, you will be able to speak the language of the company, which is something that hiring managers are looking for from their employees. To demonstrate your technology and business savvy. 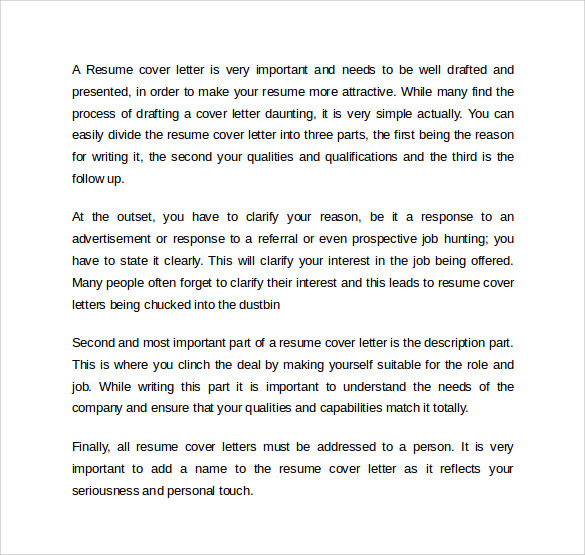 A well-written and personalized enclosure cover letter is also a well-researched cover letter. Scanning and browsing through the company’s profile can be easily done with the help of the Internet. You can mention in your letter that you find the company’s goals and visions to be in line with your principles. With a simple mention of these things, you are able to demonstrate your fascination and interest toward the company. 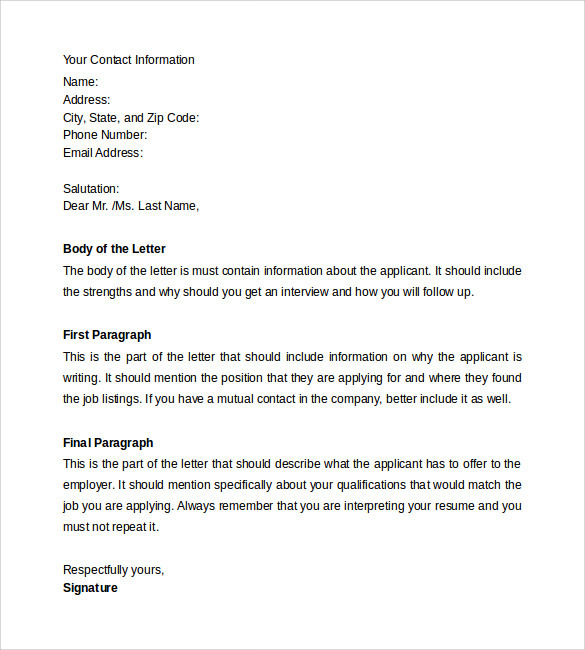 Should you be having trouble about how your cover letter should be formatted, a good reference would be this sample resume cover letter format. This document will walk you through regarding the appropriate format that a cover letter should have. your typed name and signature. This document for a sample employment cover letter will be perfect for job seekers. This is because they give a good breakdown of a good employment cover letter. 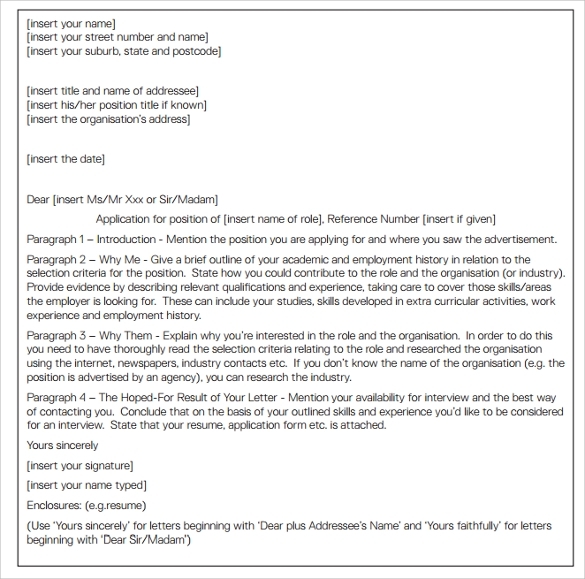 Using this sample will surely make it easier to come up with a well-written cover letter for job seekers like you. Now that you have a good idea on the reasons why it is important that cover letters are customized and the basic format that should be followed, it is high time you start composing your very own cover letter. Always remember to be honest and precise with these letters and you will surely be on your way to jump-starting your career!